I hate to have to buy apples at this time of year. 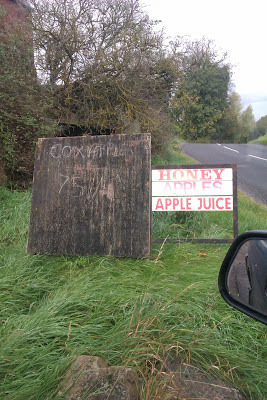 Normally I get them for free from my mum and dads farm (well I pick mums store of apples in payment). Stocking up on Cox, Scotch Bridgett, Norfolk Royal, Bramleys and numerous other types of apples, many from trees I planted on their farm 6 or 7 years ago. But not this year, the trees are pretty much bare! Buying apples - but cutting out the supermarket when I can! Instead I've had to buy apples! Luckily I've found a farm selling them on the side of the road - the most beautiful tasting cox apples on this world, much nicer than the insipid things we're treated to form the supermarket the rest of the year. These were fully ripe when picked and so taste their best. I can't wait until my own trees are producing! We have also planted lots of fruits trees but they are still young so are not fruiting very well yet, but we look forward to future harvests, as I am sure you are as well! It is a satisfying feeling knowing that one is investing in the future, isn't it! In the words of Victor Meldrew...not one bloody apple this year. Let's hope next year is normal. No apples here to speak of either. Was it too much rain?